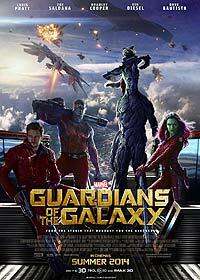 Marvel's super group of dysfunctional misfits unite to keep a powerful orb away from Ronan to protect the universe. Rocket: "Now, this is important. Once the battery is removed, everything is going to slam into emergency mode. Once we have it, we got to move quickly. So you definitely need to get that last. Or we can just get it first and improvise!" Gamora: "We're just like Kevin Bacon." Drax the Destroyer: "Nobody talks to my friends like that."